The state unit of the BJP will submit a chargesheet against the Virbhadra Singh government to the Governor, Mr V.S. Kokje, to highlight its failures on March 5, the day it completes one year in office. While the estranged BJP leaders have declared to contest the Lok Sabha poll, the state leadership maintains that it is a hasty step resulting from misinterpretation of the resolution passed by the state executive committee regarding the re-admission of expelled partymen. Despite being internationally acclaimed for her campaign against the mining mafia in her home district of Sirmaur the 76-year-old Kinkeri Devi today has no resources to fund her treatment. Kinkeri Devi was admitted to the local district hospital on Monday evening. The Himachal Pradesh High Court has stayed the implementation of the notification issued by the state government with regard to the transfer orders of Mr Onkar Sharma secretary HP Public Service Commission. The Additional Chief Judicial Magistrate, Sundernagar, Dr Baldev Singh, has returned the challan of the official car of the BBMB Chief Engineer here, with a direction to mention the provisions of the law under which the vehicle was challaned along with the name of the suspect. A senior BJP leader and former Health Minister, Mr Jagat Prakash Nadda, today blasted the state government for twisting facts about the appointment of a doctor who committed suicide yesterday at his native village, Chandi, near Kasauli, after his services were terminated by the government. Paonta Sahib: The annual Hola Mohalla celebrations will start at Gurdwara Paonta Sahib on March 4. The celebrations will continue till March 7. A four-day-long state-level Holi mela will start here from March 4. The state Chief Minister, Mr Virbhadra Singh, will declare the festival open in the evening. The HP Governor, Justice V.S. Kokje, will be the chief guest on the concluding day-function. With the announcement of Lok Sabha elections by the Election Commission of India, the local election office has started making preparations for the smooth conduct of the elections. Mr B.K. Gupta, Sessions Judge, Chamba, has convicted Karam Chand of Killar village under Section 20 of the Narcotics Drug and Psychotropic Substances (NDPS) Act for carrying 15 kg of charas and sentenced him to 10 years’ rigorous imprisonment and fined him Rs 1 lakh. Following a report in The Tribune on February 9 State’s Health authorities have ordered the Dharampur TB sanitarium authorities to look for a place for TB Training, Research and Demonstration Centre. Thakur Kaul Singh, Himachal Irrigation and Public Health Minister, said here today that with the onset of summer the IPH Department had geared up to streamline the supply of drinking water. Mr Dharam Chand Chaudhry, District Judge, Hamirpur, today issued notices to HP Secretary, Home, Satish Kumar, DSP (Enforcement) and Sansar Chand Awasthi, Inspector Vigilance in a damage case filed by Mr Prem Kaushal, a former Congress leader from Hamirpur. According to party sources, the chargesheet will come in handy to whip the Congress during campaigning for the Lok Sabha poll. It will include all acts of omission and commission by the Virbhadra Singh government and also bring to fore the inability of the ruling party to take the requisite steps to implement its election manifesto. The five-member committee headed by Mr Chander Sen, which has been assigned the task of compiling the chargesheet, met here this evening to give final touches to the document. The issues likely to figure include the alleged lottery scandal, cancellation of the entrance test for admission to JBT training course, bunglings in appointment of para-teachers, retrenchment of daily wage workers and unwarranted interference in the functioning of Constitutional bodies like the Himachal Pradesh Public Service Commission. Besides usual issues like deteriorating law and order situation, slowing down of the development process and harassment of the supporters of Opposition will also find mention in the chargesheet. The district BJP units will also submit a memorandum, which would include local issues also, to the respective Deputy Commissioners on the same day. While the estranged BJP leaders have declared to contest the Lok Sabha poll, the state leadership maintains that it is a hasty step resulting from misinterpretation of the resolution passed by the state executive committee regarding the re-admission of expelled partymen. The leaders carrying on political activities under the banner of “Mitra Milan” for the past over two years, are upset over the efforts of a faction of party to block their re-entry. They want “respectable home coming” of all “mitras” in one go. They see the procedure laid down for readmission under which they were supposed to apply to the block unit, as an affront and have rejected it. Mr Suresh Bhardwaj, state BJP chief, feels that the estranged partymen have not understood the real import of the resolution. It only stated that the expelled leaders would be taken back after taking the respective block and district units into confidence. He said it did not mean that the leaders would have to approach the block unit for re-entry. The talks for readmission could take place at any level and once the modalities were worked out, it was for this party leadership to convince the concerned block and districts unit. The “mitras” could tip electoral scales in the Hamirpur constituency where they have significant presence. The BJP, which faces the task of retaining all four seats has to settle the issue soon. A delay of the matter could prove counter productive as the “mitras” have already hardened stance. The partymen feel that the issue could be clinched if party high command intervenes. If Mr Kalyan Singh, who criticised Prime Minister, A.B. Vajpayee, could be taken back, there was nothing against the “mitras” to deny their entry. The leadership has to overcome the resistance from certain leaders, who harbour grudges against mitras. Mr Suresh Bhardwaj, state BJP chief, has appointed election in charges for all four Lok Sabha seats. A former Horticulture Minister, Mr Narinder Bragta has been made in charge of the Shimla constituency. A former Transport Minister, Mr Kishan Kapoor, of Kangra, Mr Jai Ram Thakur, MLA, of Mandi and Mr Randhir Sharma of Hamirpur. He also readmitted Mr Bhupinder Singh Chauhan, into the party. The State unit Chief of the Samajwadi Party, Mr Kishen Parmar, today resigned from the post of the state president and the basis membership of the Samajwadi Party. Mr Kishen Parmar told media persons at Jawalamukhi today that he had submitted his resignation to Mr Mulayam Singh. Mr Kishen Parmar had taken over as the party’s state chief but when the party contested 21 Assembly seats in the state during the previous poll it could not manage a single seat. Suffering from a more than six-month-old hip fracture Kinkeri Devi was today referred to IGMC hospital Shimla. Dr Bansal, who diagnosed her here, said her neglected fracture, compounded by her treatment from a quack who massaged the affected area for two months in her native village Sangarha, had diminished the chances of her recovery. She had been advised total replacement of her hip joint. Since this was a costly treatment as required at least Rs 50,000, it has put a question mark on her recovery. She had no source of income. Kinkeri Devi recalled her fight against the mining mafia and also her visit to Beijing some years back where she had represented India and also inaugurated an International Women’s Conference there. Having received several awards for her fight against illegal mining in Sirmaur she had forced the state high court to ban mining in the district. Her only grudge was the fact that she was unable to get a college opened in her tehsil. She lamented, that despite getting assurances from top political leaders like L.K. Advani and the state’s Chief Minister nothing was done about this demand. It was lamentable that an internationally renowned woman was today bereft of even a decent treatment and had to run from pillar to post just to secure admission to a hospital. It was after intervention by the deputy commissioner that she was admitted here on Monday. While she had been honoured internationally the state government was yet to acknowledge and extend some benefits to this old woman who had alone challenged the powerful mining mafia. Driven by poverty she often travels by trucks. Frail-looking Kinkeri Devi had still not lost her love for the environment and again wanted to take upon the mining mafia who she regretted had again been permitted to operate by the government. Despite her poor health she still expressed a desire to work more for the cause of environment. No NGOs came forward to extend her some financial help despite her having championed their cause for one and a half decade. After going through the record produced by the state government the court found that the transfer orders of Mr Sharma had been issued in contravention of the rules. The court was informed that Ms Anita Tegta had already assumed her charge as Secretary, HP Public Service Commission after the issuance of the transfer orders on February 27. On this the court observed that with regard to the transfer orders status quo as on February 27 be maintained. These interim directions were issued by a Division Bench comprising Chief Justice Vinod Kumar Gupta and Mr Justice Arun Kumar Goel on a petition filed by HP Public Service Commission, where in the commission had challenged the transfer orders of Mr Sharma. While issuing these directions the court further directed the state government to file its reply with in four weeks. Counsel for the commission contended that as per rules the Secretary is a whole time employee of the commission and transfer, if any, can be effected by the state with the prior consultation of the commission. Mr Sandeep Kaushik further contended that the Secretary, Mr Onkar Sharma, had been shifted because he had refused to handover the record of selection process of assistant engineer, IPH. The Additional Chief Judicial Magistrate, Sundernagar, Dr Baldev Singh, has returned the challan of the official car of the BBMB Chief Engineer here, with a direction to mention the provisions of the law under which the vehicle was challaned along with the name of the suspect. The court, by an order which was passed yesterday, returned the challan to the SHO here through the DSP and directed him to produce the challan before the court on or before March 27. On November 28 last year the local police had challaned the official vehicle of the Chief Engineer, BBMB, as the log book of the vehicle was filled in advance till November 30 and was verified by the official concerned along with the readings. The police had challaned the vehicle under the provisions of the Motor Vehicles Act. It showed the driver of the car, Mr Joginder Singh, as the offender but kept silent about the officer who had verified the log book. Police sources said earlier the police had made up its mind to register a case for fabricating records but later on it changed its mind and challaned the vehicle allegedly to oblige the BBMB authorities. This action of the police had aroused suspicion as it had neither registered a case under the provisions of the Indian Penal Code for fabricating records nor it had mention name of the BBMB official as an accused who had verified the log book. Talking to mediapersons here this afternoon, he said the doctor was appointed before 1977 and it was wrong to say that he had joined the service during the previous BJP regime. The government was giving wrong information to the media, he said. Mr Nadda clarified that a probe had been instituted against the doctor during the BJP regime as his services were not regularised on one pretext or another. He said it was wrong to say that he was given protection by the BJP and his appointment was made on fake documents. The BJP leader, who was here to meet senior district and mandal-level leaders for the implementation of “Vision 2004,” said the party would contest all the four Lok Sabha seats in the state. He said the people were fed up with the misrule of the Congress government. Replying to a question about the re-entry of dissidents into the BJP, he said the state president and the organisation secretary were final authority to take any decision in this regard after getting reports from mandal units. Mr Nadda said the names of candidates for the Lok Sabha seats would be announced on or after March 15. On March 6, a kavi sammelan will be held in the gurdwara. According to Mr Kulwant Singh Chowdhary, Manager, gurdwara prabandhak committee, Paonta Sahib, preparations for the celebrations have been completed. The entire gurdwara will be decorated. A renowned lecturer on Sikh religion, Giani Sant Singh Maskeen, will attend the function and address the congregation. Among other events, kavi darbar, a dhadi darbar, a kirtan darbar and a colourful nagar kirtan will be organised. Wrestling matches and cultural programmes will also be held. Various cultural troupes and artistes will enthral the audience during the festival. The Holi at Sujanpur Tihra has its relevance since the Katoch rulers. After 1947, the Holi of Sujanpur Tihra became a ritual only. However, after Mr Virbhadra Singh became Chief Minister of state for the first time in 1984, he visited this historic town and converted this festival as a state-level Holi festival. During the Holi festival processions are taken out all over the town. Cultural programmes are also organised at night. Mr Devesh Kumar, Deputy Commissioner, who is also the Chairman of the Holi Mela samiti, said arrangements for the successful organisation of the mela had been made by the samiti. Taleru polling station with only 22 voters in Banikhet Assembly constituency of Chamba district has the lowest number of voters in the state. According to official information, the Chask Bhatori polling booth situated at an altitude of 4170 metres in Pangi tribal valley of Chamba district is the highest polling booth in the district. There are around a dozen polling stations in the district where the polling staff has to trudge for more than 10 kilometres to reach. To reach Tepa polling station in Rajnagar constituency, the poll personnel have to walk for 18 km on foot, which is the longest distance covered by any polling parties in the district. There are a total of 2,89,620 voters including, 1,48,182 men and 1,41,438 women in the district. This number also includes 1464 service electors, the latest information reveals. There are 502 polling stations in the district. Out of these, 398 fall in four Assembly segments — Bhattiyat, Banikhet, Rajnagar and Chamba — which are a part of the Kangra Lok Sabha constituency. While 104 polling stations fall in the Bharmour tribal Assembly constituency that is a part of Mandi Lok Sabha constituency. In default of the payment of fine, Karam Chand has been ordered to undergo further imprisonment for two years. According to facts of the case, on February 8, 2002, Karam Chand was nabbed by the Additional Superintendent of Police, Mr Gyaneshwar Singh, near Kohli village carrying charas along with his accomplice Mansa Ram. In another case, the Sessions Judge, convicted Vijender Kumar, a resident of Ludhiana and sentenced him to 10 years’ rigorous imprisonment and fined Rs 1 lakh for carrying charas weighing over 1 kg. In default of the payment of fine, Vijender Kumar would undergo further imprisonment for two years. Dr V.D. 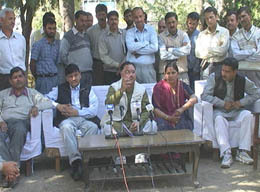 Sharma, Medical Superintendent of sanitarium was called to Shimla by Mr V.K. Chopra, State TB Officer on February 10 and told to take action in the matter. The sanitarium invited tenders for the construction of the centre today. Besides hostel and a lecture room, an addition to sanitarium laboratory would be made to set up the centre. Mr Chopra confirmed the development. Work on project would be started soon said Mr Chopra. The PWD allegedly showed poor response to sanitarium requests for setting up the centre. The sanitarium has received Rs 18 lakh for the project but the PWD estimate for the work was more than Rs 25 lakh. Sanitarium authorities have also decided to construct culture sensitivity laboratory after the PWD failed to start work. Mr Ravi Sood an NRI from the USA had donated Rs 15 lakh to the sanitarium for the laboratory. Addressing mediapersons at Baijnath today he said despite over 85 per cent villages in the state having been provided potable water there was still shortage of water. To meet this challenge the state government had planned that by next year, all villages in the state would get potable water. Answering a question he said out of 45,367 villages in the state only 500 were left without potable water. To cover up these villages the state government had planned to spend over Rs 200 crore under a time-bound project. He said besides, over 8000 villages in the state were getting inadequate supply of drinking water, therefore, the water supply schemes in these villages immediately needed augmentation. In some of the schemes the augmentation works had already been taken up by the department and the remaining schemes would be covered in the next financial year. The minister said all Executive Engineers in the state had been told to personally visit the water shortage-prone areas and also seek assistance from the local bodies and panchayats. Mr Kaushal had alleged in his complaint that he was wrongly implicated in a case in which the statue of Mahatma Gandhi was damaged in Hamirpur on August 9,2000. A local court had earlier acquitted Mr Kaushal in the case. The District Judge in his order, directed the three persons to appear in the court in person on April 7 and reply to the complaint within 30 days of the receipt of the notices.